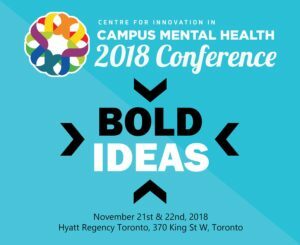 The Centre for Innovation in Campus Mental Health (CICMH) Annual Conference is a meeting place for stakeholders in post-secondary mental health across Ontario and Canada. This annual event attracts over 200 participants, 20 exhibitors, and leaders in mental health from across the country. It offers more than a dozen workshops featuring the best, promising and emerging practices in the sector. Click here for an overview of last year’s conference. This year’s theme, Bold Ideas, will focus on innovative designs and solutions to the challenges in addressing mental health needs on campus. Student affairs administrators, faculty, resident directors, and counsellors are often on the front lines with distressed students, and they – along with many other campus constituencies – are searching for ways to best serve students’ individual needs and those of the student body as a whole. The deadline for abstract submissions has been extended to May 3. For more information and to submit a proposal, visit the CICMH website.